This week, Apple announced the beta version of its new wireless, cloud-based service, iCloud. I wrote a summary of it here. The iCloud service includes some new features in the latest version of the iTunes Store, which allows you to access all your iTunes songs, mobile apps, and eBooks purchased in their respective iTunes stores and download that media to up to 10 of your devices—your iTunes supported Macs and PCs and mobile devices. This downloading can all be done wirelessly without you having to connect your devices to a computer or the iTunes application itself. To use the Purchased feature of your iTunes-supported Mac or PC, you will need to download the most recent 10.3.1 version of the iTunes application. After doing so, you can log into the iTunes Store as you normally would, and then click on "Purchased", which is currently located in the Quick Links column of the iTunes Store. When you click on Purchased, you will see a list of all your purchased iTunes Store items. There's also a tab that consists of all the purchases NOT in the library of your Mac. So if, for example, you have made all your iTunes purchases on your desktop Mac or PC, the purchases you have not downloaded to the iTunes library of your laptop will show up in this list. In the Music section, you can click on the downloads buttons to download any song or complete albums from your list to any of your authorized Macs or PCs with a current version of iTunes. You can also download ebooks you purchased from the iBooks Store. You will typically want to download these to your other mobile devices. Currently, there's no iBooks reader for Mac or PC. You can only read these books on your iOS mobile devices. So the only reason you might download them to another Mac or PC is to have them backed up on those computers. But even that's not necessary, because those ebooks will always be saved to your iTunes account for downloading. The same goes for the mobile apps. You will only need to download them to your mobile devices. If you would like to download your purchased songs to your iOS mobile devices, there's a couple ways this can be done. First, you can simply log into your iTunes account via the iTunes application on your iPhone, iPad, or iPod touch. At the bottom of the menu, tap on Purchased. Again, you will see a list of all your purchased songs, and another list of your songs not yet downloaded to that device. Tap on any individual song or collection of songs, and you can download them to your device from your iTunes account. 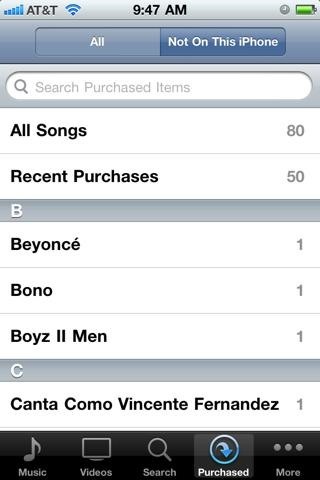 You can also choose to have your iTunes purchases automatically downloaded to each of your mobile devices. 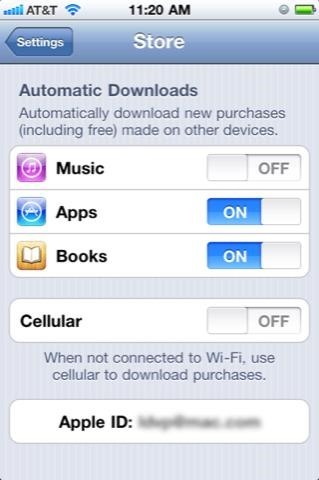 If you purchased an app or song on your iPhone, for example, it can be automatically downloaded to your iPad or iPod touch—if you enable that automation feature on your devices. To enable this automaton feature, launch the Settings app on each of your devices, and select the Store settings from the list. From there, enable the types of purchases you want automatically downloaded. This download process will occur only with your new purchases (the free apps, songs, and ebooks are considered purchases as well.) By default, the automatic downloads will occur only over WiFi, but you can enable to also have it done over 3G access as well. (Though you might not want to enable this, because it could eat into your 3G bandwidth when the downloads occur.) The automatic download will take place even if the other device is in sleep mode. Of course, if you download an iPad-compatible only app, it will not automatically download to your iPhone or iPod touch. 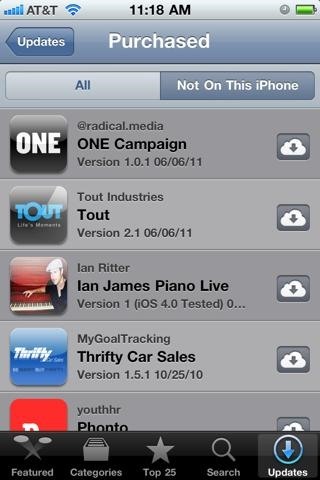 Another way to access all your purchased apps is through the App Store application of your mobile devices. When you open that app, you can tap on the Updates tab, and at the top of the page, you can tap on "Purchased" to navigate to those apps. Again, the list of items will include all your purchases (including free ones), as well as the list of apps you purchased that are not yet downloaded on that device. From there you can selectively download apps. These automatic download features are a huge time saver, and it also insures that you will always have access to your purchases.